Like many other times, today we have a lot of great cruise deals at hand, but the most convenient is probably the Norwegian freestyle cruises that are on sale now for a lot of destinations around the world. The other offers you may find include an oceanview cabin on a 3 nights Bahamas cruise from $159 per person, week long cruise to Alaska and the glaciers from $799 per person, 10 nights Panama Canal journey on Holland America from $1,299 pp and more. Act fast, such offers will not last long! Many Norwegian cruises are part of this grand sale where those who book an inside, oceanview or balcony cabin can choose one of four special extras. These are credit for shore excursions, a specialty dining package, the ultimate beverage package or free Wi-fi package. Those who book a suite or The Haven will get all four of them. Furthermore, if you book select sailings, the 3rd and 4th guests in your cabin will stay free. 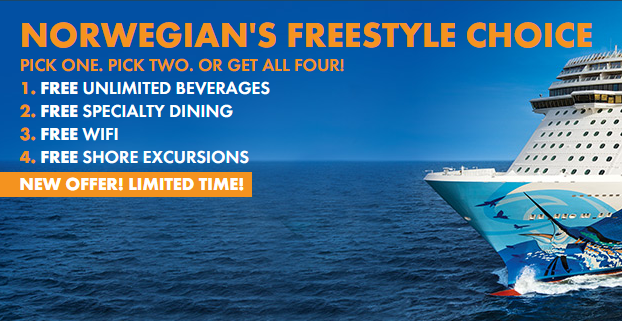 There are tens of cruises and sailing participating in this Norwegian freestyle sale with destinations in Asia, Europe, the Caribbean, Canada, South America, Mexico and even Australia. Book one of those cruise deals or search for others that you like better. Choose some providers and compare their prices to see where you can get the cheapest offer and the best value. This entry was posted on Monday, November 23rd, 2015 at 3:53 pm and is filed under Cruise Deals, Top Deals. You can follow any responses to this entry through the RSS 2.0 feed. You can leave a response, or trackback from your own site.